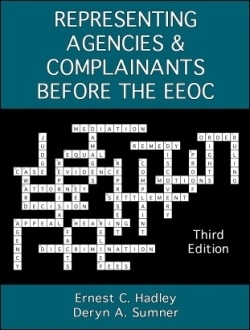 Written by Ernest Hadley and Deryn Sumner, both practitioners before the EEOC, Representing Agencies and Complainants Before the EEOC is an authoritative federal sector EEO practice guide for representatives of complainants and agencies. Practice tips and citations to case law are discussed and applied to a wide variety of circumstances confronted by the practitioner when preparing and trying cases before the EEOC. The EEOC Administrative Judges' Handbook is discussed. Extensive analysis of Part 1614 and MD-110 is also provided. New in 2013: In its 3rd edition, Representing offers statutory additions and changes, including the ADAAA and GINA, and regulatory updates; expanded discussion and updates on sanctions, motions to amend, mixed motive cases, age discrimination, attorney fees and costs, compliance and enforcement, the role of agency counsel in investigations, disability discrimination and accommodations, and complaints based on sexual orientation; with discussion of significant Supreme Court decisions involving supervisors, major life activities, and retaliation.